Those who thrive in the face of international adversity are always given special global recognition from people all over the world for their dedication to peace, economic prosperity, or justice. Such people are renowned for being compassionate, driven individuals with an incredible knack for leadership. In the United States, it seems as though the majority of, if not all, presidents are given places of honor within the circle of leaders the country as a whole has to offer. However, some stand far out among the rest. FDR is one of these said people, for his sheer determination and brave, confident demeanor lead him to become one of the memorable figures of this nation. His leadership skills were astute, and his refusal to accept anything less than the best case scenario was admirable. His abaility to continuously persevere, no matter the battles he was fighting, those that even tried to cripple his own body could not stop him, for he had goals that he wanted to see out. Franklin Delano Roosevelt, affectionately known as FDR by the American people, was the 32nd president of the United States. He is the only president to have served four terms, because he was so popular among the people. During his terms as president, Roosevelt led the United States through both the Great Depression and World War II. These events made him a central figure not only in America, but in the world. Roosevelt was born in 1882 and grew up in upstate New York. He attended Harvard College and married his wife Eleanor Roosevelt in 1905. His career in politics began in 1910, when he became a member of the New York Senate. Following this, he served as Assistant Secretary of the Navy under President Woodrow Wilson. When James M. Cox ran for president in 1920, he chose Roosevelt as his running mate. The campaign was unsuccessful, and soon after, Roosevelt’s political career came to a startling halt when he contracted polio, paralyzing the lower half of his body. In the years following his illness, Roosevelt exhibited incredible strength as he fought to recover. He was only able to do so to a certain point, but it was enough that he was able to return to politics at the Democratic National Convention in 1924. There, he place Alfred E Smith’s name into nomination, who in turn asked Roosevelt to run for Governor of New York in the 1928 election. Roosevelt’s campaign was successful, and he led his state through the Great Depression from 1929 to 1932, before defeating incumbent Herbert Hoover and becoming president in November 1932. Within his first few months of his presidency, Roosevelt spearheaded major legislation to counteract the effects of the Great Depression and help the country dig itself out of the massive hole it was in. His New Deal was a collection of programs and legislation geared towards ending the depression. It included government jobs for the unemployed; regulation of banks, Wall Street, and transportation; and overall economic growth. His programs were primarily designed as support systems for farmers and other unemployed persons. Roosevelt’s New Deal saw immediate success with an economic boom from 1933 to 1937. 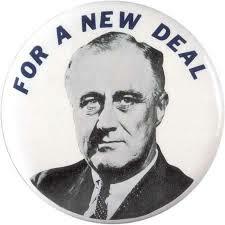 Unfortunately, this New Deal proved to have a fatal flaw, it’s improvements on the economy would not last. The country slipped back into a deep recession from 1937 to 1938. This time, however, Roosevelt’s attention was sharply diverted to international issues, with World War II officially coming about in 1939. In the beginning, FDR gave only substantial financial support to both China and the United Kingdom to support their efforts against aggression from Japan and Nazi Germany. On December 7, 1941, this all would change. Japan’s attack on Pearl Harbor pulled the United States into World War II, and Roosevelt with it. It was during these times that FDR would shine his brightest. Foreign policy and diplomacy were strong suits for this president, as evidence almost entirely by his relations with British Prime Minister Winston Churchill and Soviet leader Joseph Stalin. He worked with these powerful world leaders in directing the Allies towards victory and against Nazi Germany, Fascist Italy, and Imperial Japan. This effort included a mobilization of the United States economy to support the war and implementing a war strategy to defeat the Axis Powers. The war had a very positive effect on the economy, with Roosevelt’s direction. The industrial economy boomed and the unemployment rate dropped down to an extremely low 2%. ; however, all of these improvements to the United States during the war came at an extreme cost – Roosevelt’s health. It declined seriously throughout the years, and he died only three months into his fourth term, in 1945. He would be succeeded by his Vice President, Harry S. Truman, who would carry out the remainder of Roosevelt’s war strategy to finally end The Second World War in 1945. Roosevelt’s life was a constant uphill battle, both personally and politically. In both, he achieved great success, but only after hard work and dedication prevailed. When diagnosed with polio, he refused to accept paralysis. He underwent every experimental treatment available at the time and tried a wide range of therapies. This eventually led him to found a hydrotherapy treatment center for polio patients in Warm Springs, Georgia. This center is still operating today as the Roosevelt Warm Springs Institute for Rehabilitation. Once in office, Roosevelt also helped found the National Institute for Infantile Paralysis, now known as the March of Dimes. Personally, he made a strong effort to convince the public he was improving, teaching himself to “walk” with iron braces and a cane. He was careful to never be seen in his wheelchair in public, and instead stood with support from an aide or one of his sons. Struggling with polio brought out Roosevelt’s best leadership qualities that would become assets in his political career. He was brave and determined, traits that allowed him to visibly beat polio, even if only for a few minutes at a time in the public eye. It is also what allowed him to beat both the Great Depression and World War II, and what made him a fantastic president.